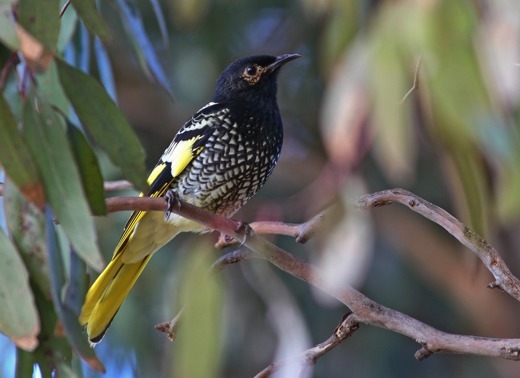 With a population numbering fewer than 1000 birds, the Regent Honeyeater is one of Australia’s most endangered birds. The species occasionally occurs around the Lurg hills, the Warby Ranges, the Killawarra forest and sometimes on the Ovens-King River Valleys. Like most other threatened birds, it was formerly much more common and widespread but habitat loss has significantly reduced its population. The Regent Honeyeater is most commonly seen singly, in pairs or occasionally small groups. It usually associates with other small honeyeaters and lorikeets where it feeds on nectar primarily from eucalypt blossom, lerp from eucalypt foliage and sometimes aerial insects captured acrobatically in hawking flights from the canopy. Their soft calls are distinctive but quite often not heard above the calls of other birds, therefore Regent Honeyeaters can easily go unnoticed. In recent years, the species has been the subject of an intensive conservation program where birds that have been captive-bred have been released in the Chiltern-Mt Pilot National Park. Some of these birds, which are identifiable through bands on their legs, have turned-up in the Glenrowan region along with wild-bred birds.